GOT HIGH EMPLOYEE TURNOVER? HERE’S YOUR SECRET TO SUCCESS. A 2017 retention struggle is upon us. High employee turnover becomes a key challenge as businesses lose top-tier talent to competitors in this grueling  war for talent. Even more detrimental in high-turnover industries, low retention rates negatively impact your teams, your customers, and your bottom line. So how do you increase and maintain employee engagement in today’s tough talent market? A focus on employee engagement. 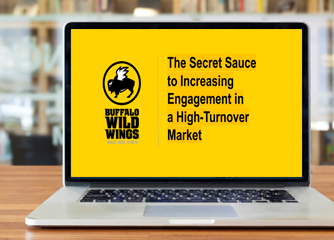 Tune in as Willow Terry, the Vice President of Organization and Team Effectiveness at Buffalo Wild Wings reveals the restaurant's secret sauce for increasing employee engagement in a high employee turnover market.